The PreconLP is designed to convert a line level signal to a phono level signal with the proper inverse RIAA response characteristics. It is very accurate and has several applications in audio engineering and Hi Fi systems. Used with a CD player and an appropriate burn in disc, the PreconLP can provide a burn in signal for your phono preamp. Used with a signal generator, the PreconLP can provide a reverse RIAA signal suitable for testing the accuracy of any phono preamp. When sourced into a 100 ohm load, the output level will match low output moving coil cartridges. Maybe it's the costly marketing, I don't know, but it really is not all that expensive to include hi quality parts like 2% propylene capacitors and gold/teflon RCA's. Yet the sonic advantages of doing these things is unquestionable. 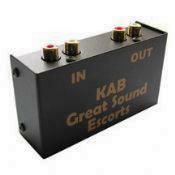 The really great features to take note of with the KAB PreconLP are, I believe, the high performance vs price. The last phono burn in device I saw sold for over $300 and made no claims for accuracy, nor did it have the build quality of the PreconLP. Burn In is the process of stabilizing various components in the audio signal path. Capacitors are particularly sensitive to this process. Tube circuits have at least one capacitor that never sees a stabilizing potential in normal use. Bi polar solid state designs operate all their signal components at 0 bias. The burn-in process will improve the behavior of these components. The enhancement is temporary the burn in process should be repeated every 6 months.